Straight-up: a bet on a single number. Split: a two number bet. Trio: a bet that covers the numbers 0, 1, 2 or 00, 2, 3. Street: a three number bet. Corner (or square): a bet on 4 numbers. Five Number: a bet that covers 5 numbers (0, 00, 1, 2, 3). Six Line: a bet that covers six numbers or two lines. Column Bets: a bet on 12 numbers on any of three lines on the roulette table (like as 1st line - 1-4-7-10 and down to 34). The chip is to be placed on the square below the last number in this line. Dozen Bets: a bet on either the first (1-12), second (13-24), or third (25-36) twelve numbers. Red / Black: a bet that the number will be either red or black. Even / Odd: a bet on even or odd numbers. Lucky Number Generator – roulettedoc.com/lucky-number-generator.htm Find out your lucky numbers specially for the game of roulette. 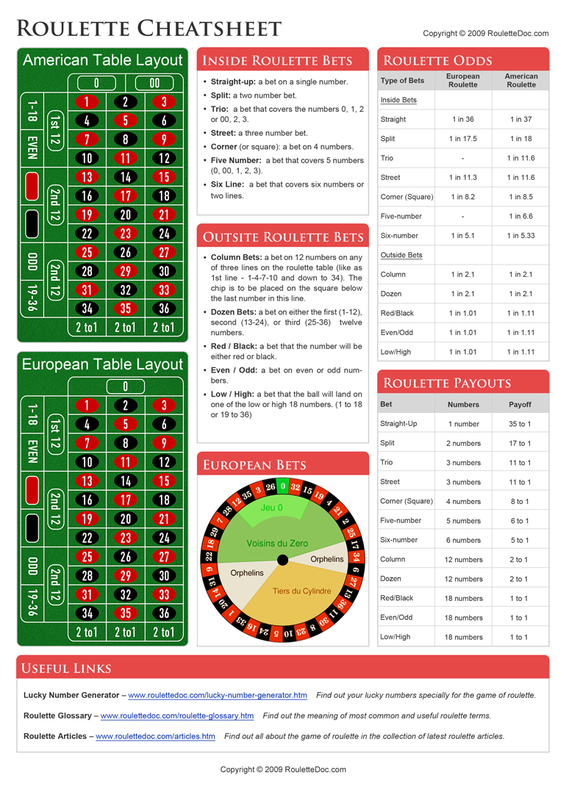 Roulette Glossary – roulettedoc.com/roulette-glossary.htm Find out the meaning of most common and useful roulette terms. Roulette Articles – roulettedoc.com/articles.htm Find out all about the game of roulette in the collection of latest roulette articles.